Business Insurance has been tracking and publishing reports on the largest brokerages in the United States dating back to 1972. At that time, the top brokerage, Marsh & McLennan Companies, reported $151 million of brokerage revenue. The total U.S. brokerage revenue of the top 15 brokerages, based on 1971 revenue, was $455 million. For perspective, today, as published in July 2018 by Business Insurance based on 2017 revenue, total U.S. brokerage revenue of $455 million would have equated to the 15th-largest brokerage on the list. There has been significant movement among the top 100 brokerages over this 46-year period. 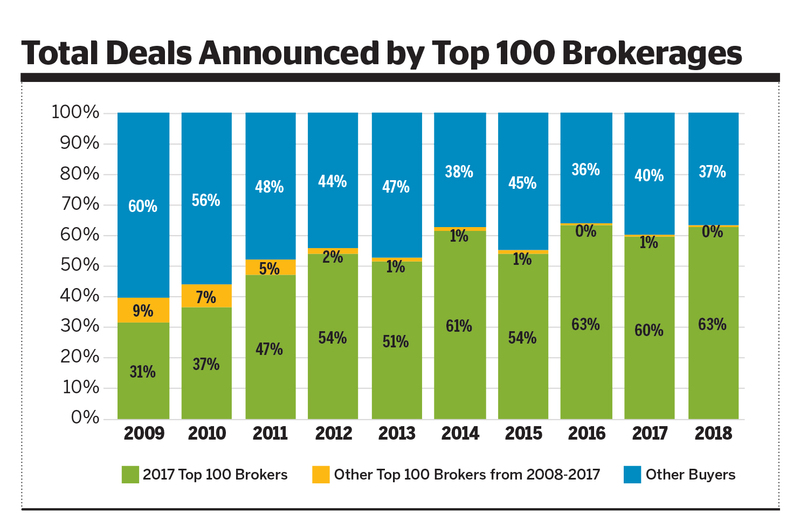 Although from a deal count perspective consolidation might not be as prevalent in the top 100 as it is for the industry as a whole, there have historically been—and continue to be—many acquisitions of top-100 brokerages. We examined deal activity from 2009 to 2018, based on revenue reported for fiscal years ending between 2008 to 2017. During this time, there have been 154 unique brokerages that have been in the top 100. Of the 100 brokerages included on the 2009 list (based on 2008 revenue), 64 of them remained on the list in 2018. Overall there has not been significant revenue growth, which is inclusive of organic and acquisitive growth, for most of these spots over the last 10 years, and the variation in who controls the revenue has been fairly consistent. Overall there has not been significant revenue growth, either organic or acquisitive growth, for most of these spots over the last 10 years, and the variation in who controls the revenue has been fairly consistent. Further supporting the fragmented nature of the insurance brokerage market, the top 25 firms have controlled approximately 84% or more of the total brokerage revenue of the top 100 firms for the last 10 years, with the bottom 25% controlling only 2%-3%. 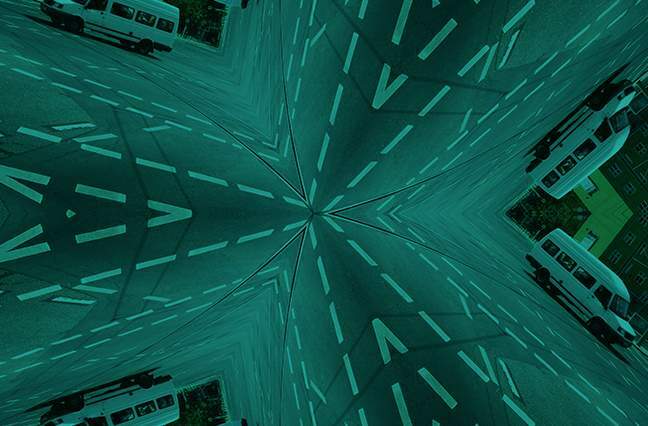 However, when examining the underlying firms that make up these different quartiles, the prevalence and dominance of brokerages backed by private equity (PE) is significant in more recent years. Many of the top 100 brokerages rely on acquisitions for growth, especially the aforementioned PE-backed brokerages. Considering the fragmentation that exists in the marketplace, it is interesting—though not surprising—that the top 100 firms account for the majority of the transactions. This percentage has continued to soar as PE-backed brokerages have entered the top 100. Over the last 10 years, there have been at least 53 top-100 firms that have been acquired by a total of 19 unique buyers (with another announcement in January 2019, for Marsh & McLennan Companies’ pending acquisition of Bouchard Insurance, ranked 74th on the 2018 list). Peeling back the onion on these acquirers reveals a few trends. Marsh & McLennan Companies is by far the leading acquirer of top-100 brokerages, acquiring 12 top-100 firms (with, as mentioned, another scheduled to close in early 2019). USI has had a history of buying bank-owned top-100 brokerages, with four large bank-owned acquisitions since 2009. USI also acquired two other top-100 firms during this period. Gallagher also has six acquisitions of top-100 brokerages over the last decade. And last, but certainly not least, considering the relatively small number of public brokerages compared to the large volume of other buyer types, public brokerages have maintained a large market share of the acquisitions of top-100 brokerages. Consolidation continues to play a large role in the makeup of the top 100 brokerages, and based on recent history, it appears it will play an increasingly dramatic role in years to come. Unless otherwise noted, all revenue figures and revenue-related metrics are based on information published by Business Insurance in its annual “Top 100 Largest Brokers of United States Business” issue. This information is self-reported by brokerage submission and is not audited or verified by Business Insurance. The revenue reported is generated from U.S.-based clients, and to be eligible for inclusion in the report, brokerages must derive no more than 49% of their gross revenues from personal lines business. As the information is self-reported, Business Insurance publishes only the information that is reported to them.